for an evening of massage and sacred sound! ​Immerse yourself in the Sacred Sounds of gongs, Tibetan, Alchemy and quartz crystal singing bowls as you experience the deep therapeutic benefits of massage. ​Let the healing vibrations take your massage to the next level! Each person will receive individual attention one at a time! 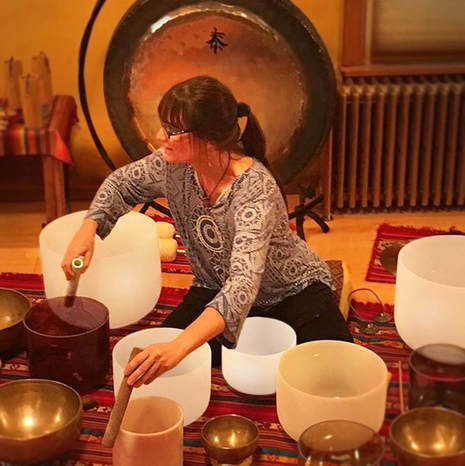 Andrea will use Biosonics Tuning Forks that help to relax the nervous system and will place Tibetan singing bowls directly on the body. You will experience different vibrations gently penetrating your body. There will be a special and unique instrument participants may try made specifically for use on the body! Colleen will offer massage along with essential oils simultaneously as Andrea works with you using bowls and tuning forks, taking your massage to the next level! Please note ~ If you have metal in the body, a pacemaker, are pregnant, or have any allergies to essential oils, please let Andrea and Colleen know! This special event is an opportunity to receive the therapeutic benefits of massage along with essential oils as you are bathed in the healing vibrations of multiple gongs, Tibetan, quartz crystal and alchemy singing bowls. We will close with a 30 minute Sound Bath experience! Please be sure to dress comfortably and bring a blanket and a pillow with you, an eye mask is nice too and adds to the whole sensory experience! You will be lying on the floor on a yoga mat for close to 2 hours, what you bring with you will be for your added comfort! A yoga mat and 1 blanket will be set up for you there. Cushions and other yoga props are also available! Please note ~ There is a short flight of stairs leading up to the Yoga Studio! Pre Registration and Pre Payment will save your spot! 3. Cash at the door (If you choose this option you need to make the commitment and reserve your spot, as space is limited) Please call or email Andrea to register.